We regularly engage LBPs. Always check the LBP Register to ensure your building practitioner is licensed. What is Leaky Building syndrome? 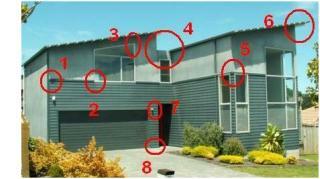 The problem of 'leaky buildings' has emerged as an issue of great concern to many New Zealand home owners. This concern is understandable as buying property is often the largest financial commitment we make. The purchase of a home can carry a very strong emotional element. Leaky buildings are those that first allow water to penetrate the building envelope or cladding system, and then hold the water in the wall cavity. When the water stays in the wall for some time, the building's timber framing stays wet and it's moisture levels rise - and it is this moisture in the timber that allows the growth of mould and fungus which literally rots or eats away at the timber framing. The problems occur most commonly when the system fails. That is - there is a combination of design, cladding, lack of cavity use, and untreated or otherwise inappropriate building materials. The most commonly affected building are new constructions (built since the early nineties) using monolithic cladding systems and designs which do not help with water deflection as above. There may be an obvious lack of eaves, for example. Estimating the costs of fixing leaky buildings is difficult due to the hidden nature of the problem. Tell-tale signs only become apparent in the later stages of building decay. It has been estimated that 6000 to 12000 apartment dwellings may be suffering from problems with weathertightness. Consumer magazine suggests that based on approximately 35 to 40 percent of these have used monolithic cladding materials, resulting in 75,000 to 90,000 homes at risk (Consumer October 2002). Having your fears confirmed is the beginning and it is understandable that the project ahead may seem large and overwhelming. From here on in, with our help you will be able to decide upon and action the path to repair that will ensure you retain the value of your property and the health of those who live and work there. The path to repair may involve an engineer, independent reports, having plans drafted and consented and then the repairs and recladding started. Once assessments have been made as to the extent of the works required and the correct path to follow, we will discuss options for repair that meets construction criteria and is affordable. A comprehensive quote will be created that will allow for rot replacement and provide a means for dealing with unquantifiable costs. A quality management program and works program showing the duration of the project will be supplied. Our documentation meets the standard to pursue a legal claim if this is part of your pathway to repair. If a legal claim is being taken we would also organize for an independent Quantity Surveyor to provide an initial estimate. Best Build Construction has worked alongside NZ's leading engineers to identify and rectify systemic failures in the building envelope and have now repaired over 450+ dwellings. We bring integrity and the best technical knowledge to effect the repairs with long lasting quality assured. It is often difficult to assess if your property is leaking, we are just a phone call away to help you find out if you have a leaky home please call us! I have a single house dwelling - what do I do? You own a single house dwelling, so we can assume that you don't have a Body Corporate or other affected parties to talk to before you act. The repair process may depend on the method of funding and whether you are able to take legal action to recover costs. Best Build Construction Ltd can provide advice as to the extent of repairs. Where required we can put you in touch with industry professionals for legal and technical services if required. We work with the owner to select a new cladding system and facilitate the entire design and building consent process prior to the commencement of the repairs. When you accept the quotation we will provide you with a start date and our Site Manager and Technical Manager will visit you prior to commencement to explain the process in full and answer any questions. On commencement, we will install ground protection, remove any vegetation that may get damaged or hinder the repair process, remove any building appendages such as fencing attached to the building, then erect the scaffolding around the building. Once the building has been protected from the weather we then remove the cladding. This generally involves cutting the cladding into sections and removing these sections from the building. Health and safety considerations include dust , noise and falling debris. As the cladding is removed we assess the timber framing for damage caused by water ingress, moulds and decay. instructions are then issued regarding the removal of any decayed framing or lining. Evidential samples and/or photographs can be taken at this stage if they are required for any litigation that may be under consideration. We will then take the necessary steps to safely remove affected material and if any potentially harmful substances (such as stacci moulds) are present we undertake our contamination procedures. Affected framing and linings are then replaced as instructed and any insitu timber treatment is carried out. During this time the building is assessed for compliance with the Building Code. These procedure may include such works as concrete nib installation under external walls to alleviate the problems with insufficient internal to external ground height differential. In order to meet the new requirements of the building act, your windows will need to be removed to provide appropriate sustainable weathering. This will allow for the building wrap to be installed into the window openings and an efficient flashing system to be installed. We will then install the requested cladding system on a ventilated cavity system and carry out any repairs required to the internal linings. The works to the building envelope is then completed, The tarpaulins and scaffolding removed and landscaping and building appendages reinstated. Most of our clients have chosen to engage suitably qualified engineers to prepare a report, draft consent documents, oversee the repairs and collect evidence to enable the building of a case for compensation from parties they deem at fault for the failures in their building. View video from Grimshaw & Co Ltd about legal opportunities to recover cost. Almost all buildings let moisture past the first line of defence - the roof and/or the cladding - at some time in their life. This can stem from imperfections in the design and construction, or subsequent actions such as adding an outside light or TV aerial, or lack of maintenance, or raising garden levels too high. It is what happens to the water when it gets in and how much that is most important. When a villa or bungalow leaks they generally let water in through windows or through the weather board exterior cladding. However in most cases the water drains out the bottom and dries out due to the air circulation and typically the studs are more resistant timber such as rimu or kauri. They also tend to have a rain screen in the form of 'eaves' and are generally single storey. However, with more modern designs there may be less defence against water ingress and less ability to deal with this moisture when it penetrates the building envelope. Moisture can be retained behind the cladding with no means to drain or dry out. This moisture is hidden, usually on the back of the cladding so the owner or occupant can be quite unaware. Retained moisture can lead to mould growth on building materials, decay of timber framing and rusting of steel fixings and framing. 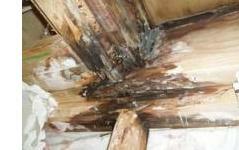 With timber untreated against decay, the chance of decay occurring is very high. The nature of some of these decays is of great concern, e.g. dry rot. All timber decays and breaks down in moisture - even marine grade H6 timber will rot eventually!! What buildings are at risk? Buildings that contain untreated or improperly treated timber when used in conjunction with most non-cavity monolithic cladding systems. Cladding that goes down to and past outside ground heights. Building designs which feature minimal water shedding or deflection and/or complex designs. For example: small or no eaves especially on more than one storey buildings and on elevated or exposed sites. Non cavity based solid Plaster, EFIS and fibre cement sheet cladding systems. Flat plaster parapet and balcony tops. Simple cavity based designs with deflection features and suitably treated timber. Decks most at risk are untreated timber cantilevered decks. However, many styles of deck have found to be at risk including closed in decks with solid balustrades. Many hundreds of home owners around NZ have been advised not to use their decks due to the potential that they may collapse. If in doubt get your deck checked by a suitably qualified professional. Remember that just because you can't see water entering, your property may still be leaking, and the associated health risks posed are very real. When dealing with leaking buildings the potential for finding mould in wall cavities is very high, and it is important that the proper precautions are taken to ensure that neither workers nor building occupants are exposed to health hazards from moulds during building repairs. On 31 August 2002 the Building Industry Authority (BIA) released the Report of the Overview Group on the Weathertightness of Buildings to the Building Industry Authority. One of its recommendations was that the BIA work with the Public Health Directorate of the Ministry of Health to resolve how potential health risks associated with fungal decay can be identified and to provide information on precautions that need to be taken when removing cladding. The Ministry has provided information to the BIA and to public health services so they can respond to public concerns among their local communities. The Occupational Safety and Health Service (OSH) has also developed a comprehensive information bulletin on health effects and precautions for builders and contractors in consultation with health officials. Moulds and other fungal spores are ubiquitous. They can be isolated from both indoor and outdoor air as well as from soils and water bodies. Mould spores are carried by the wind and will grow in any suitable conditions. Some of the moulds in houses cause wood rotting; others merely grow on damp surfaces. Any conditions that lead to dampness in buildings can give rise to elevated levels of moulds. Common causes are condensation due to unflued gas heaters and cookers, tumble driers, poor ventilation and cold spots due to poor insulation, which is why moulds are often found on the inside of outside walls. Leaky buildings are obviously another potential source of dampness. Leaky buildings reflect a number of problems with building detailing, specification or construction. While most moulds are harmless to healthy individuals - and some are an essential component of foodstuffs, such as blue cheese - dampness and mould growth in buildings have been traditionally associated with poor health. A number of Scottish and Welsh studies concluded that in houses with elevated levels of moulds adults demonstrated increased symptoms of nausea, vomiting, blocked nose, breathlessness, wheezing, backache, fainting and bad nerves and emotional reactions. Children suffered more than usually from aches, pains, diarrhoea, headache, vomiting, sore throats, coughing, fever and respiratory symptoms. Fungi are ubiquitous throughout the environment and there are many moulds/fungi that cause health effects, although few cause severe systemic disease. For example, fungi may cause superficial skin infection such as ringworm or athlete's foot, mucous membrane infections such as candidiasis (thrush), lung infections such as aspergillosis and serious infections such as endocarditis (an infection surrounding a heart valve) or brain abscess. Systemic fungal infections are more likely to occur in people whose immune systems are suppressed (due to infections such as the human immunodeficiency virus) or who have chronic illnesses such as diabetes. A fungus may also produce a toxin that is harmful, such as the mould Stachybotris chartarum. Stachybotris sp, found in buildings with damp and mould, has been suggested to be a cause of sick building syndrome and is linked to the building inhabitants/workers complaining of eye and nasal irritation, fatigue and other symptoms. However, many different moulds grow in damp buildings and do not cause illness. Investigation following an outbreak of severe illness with pulmonary haemorrhage in young children in Cleveland, Ohio, suggested Stachybotris sp may be implicated, but this has not been proven. Research and information about fungi as pathogens will continue to emerge. The national reference mycology laboratory at Auckland Hospital has confirmed that they are unaware of confirmed human cases of illness from exposure to Stachybotris in New Zealand. There is, however, no formal surveillance system as this is not a notifiable disease. I have a multi-dwelling unit; now what do I do? You own a multi-unit dwelling/building, so you most likely have a Body Corporate or other affected parties to talk to before you act. After you have had a building report commissioned you can get legal advice, get plans drafted and consented then engage Best Build Construction to carry out the recladding. Most of our clients have chosen to engage suitably qualified engineers to prepare a report, draft consent documents, oversee the repairs and collect evidence to enable the building of a case for compensation from parties they deem at fault for the failures in their building. There has been much publicity regarding the governments WHRS and the services arguable short comings. 1) Engage an engineer or suitably qualified person to carry out an inspection and prepare a report. The New Zealand Institute of Building Surveyors is a national body of skilled, professional building consultants who have a high degree of qualification, knowledge and experience. They can help you find the professional you need to get a report done. NZIBS Objectives: To provide a high quality of professionalism in Building Consultancy and Expert Appraisal; To provide clear information, enabling buyers and sellers to proceed with confidence. Provided that it appears that your claim meets, or is capable of meeting, the eligibility criteria set out in the Weathertight Homes Resolution Services Act 2002 and 2006, the WHRS will provide an assessment report on your home, and provide access to low cost resolution services. Assessments to determine eligibility for the Service and the extent of property damage are provided at no cost to homeowners. If claims are eligible homeowners can choose to use the WHRS's voluntary mediation process, opt for compulsory adjudication, or decide to take no further action. Homeowners are required to pay $200 towards the cost of mediation and $400 towards the cost of adjudication. The problem of 'leaky buildings' has recently emerged as an issue of great concern to many New Zealand home owners. If you have any concern or suspicion that you may have a leaky home, place an application with Weathertight Homes Resolution Service. It will stop the clock on the 10 year limit requirement. On 1 June a milestone in the development of the scheme was achieved with support by the eight councils in communities most directly affected by leaky homes. The eight councils - Auckland, Christchurch, Manukau, Waitakere, North Shore, Tauranga, Wellington and Rodney District - collectively represent around 90 per cent of current leaky home claims. Local Government New Zealand described this as "resounding endorsement" for the scheme by those councils. The support means the package is now workable. Building and Construction Minister Maurice Williamson said: "The Government's leaky homes package has now received the critical mass of council support needed for it to go ahead." The door remains open for other councils to agree to support the package at a later stage, depending on their local situation and need. The package centres on the Government and local authorities each contributing 25 per cent of agreed repair costs and homeowners funding the remaining 50 per cent, backed by a government loan guarantee. Homeowners will need to be eligible to make a claim under the Weathertight Homes Resolution Services Act to access the financial assistance package once it is launched. The proposed package will be voluntary and in addition to the current disputes and litigation process for owners of leaky homes. It is also conditional on homeowners foregoing the right to sue local authorities or the Crown in relation to the claim. Under the proposal, homeowners would still have the option to pursue other liable parties such as builders, developers and manufacturers of defective building products. The financial assistance package is about spreading the costs of the leaky homes problem as evenly and fairly as possible to help affected homeowners to move on with their lives. Although the package won't be suitable for everyone, it represents another option for homeowners and is a fair solution for all New Zealanders. The Weathertight e-news has more information on the assistance package. The intention is that homeowners who currently have claims in the system that are yet to be resolved will be able to apply for the financial assistance package. This detail will be developed in the coming months. In the meantime, homeowners who are close to the 10-year build limit can make an application to the Department of Building and Housing to start the claim process. Since the announcement of the proposed financial assistance package, 187 homeowners (with 84 claims) have 'stopped the clock' by applying for an assessment (at 30 June). Most of the claims are for stand-alone houses with six of the claims relating to apartment or townhouse complexes of two or more homes (109 homes). The majority of the new claims are for homes in Auckland (121 homes) with North Shore (25 homes), Christchurch (six homes), Wellington (five homes) and Rodney (five homes) also having significant number of claims. Other local authority areas have received fewer than five claims each. For more information go to www.dbh.govt.nz or phone 0800 116 926. You will have met a representative of Best Build Construction Ltd when we visit site prior to submitting our quotation. When you accept the tender we will provide you with a start date and our Company Manager and Contract Manager will visit you a few weeks before this date to give you an outline of what to expect and answer any questions. Whether you choose to stay in the property whilst repairs are underway comes down to a personal choice. The works are undoubtedly more efficient if the building is empty however you might not be able to afford to leave, or might just prefer to stay put. You can expect some draughts, and dust and noise, especially during the cladding removal stage. This tends to be greater when you are at home during standard working hours of course! What should I expect from Best Build Construction? The Best Build Construction Company and/or the Contract manager will meet with your elected building committee and body corporate and outline our requirements for the contract, and answer any questions they or the other owners/tenants may have. We will outline what units will be affected, when, if it is a staged contract as well as negotiate areas in the complex site office, storage facilities and contractor car parking. We then write to all of the occupiers of the building advising them of what to expect and introduce our tenant/occupier liaison person. This person is charged with advising the occupier of the units of what is happening and what they can expect at certain times throughout the project and arranging access to units when required. This is a very important part of the process as tenant retention and occupier co-operation is vital to the success of the project. It is our experience that it pays to be proactive with tenants. It may be better to offer them a significant rent reduction to compensate them for inconvenience, after all if they do decide to leave, it is most likely to be difficult to tenant a building that is covered in tarpaulins and scaffolding! We advise the overseeing engineers of any areas of concern and they then issue instructions regarding the removal of any decayed framing or linings as well as take evidential samples and/or photographs if they are required for any litigation that may be under consideration. We will then take the necessary steps to safely remove affected material and if any potentially harmful substances (such as stacci moulds) are present we undertake our contamination procedures. Affected framing and linings are then replaced as instructed and any insitu timber treatment is carried out. During this time the building is assessed for compliance with the Building Code. Any required work would be carried out at the direction of the instructing engineer. These procedure may include such works as concrete nib installation under external walls to alleviate the problems with insufficient internal to external ground height differential.